Help control insects in your yard naturally with this Single Chamber Bark Clad Bat House and Pole Kit. This package offers a bat house and pole for convenient mounting, making it simple to invite these wonderful pollinators to your area. The single chamber of this wooden shelter accommodates up to 100 bats, while polyethylene mesh on the interior offers them plenty of gripping spots. A 0.25" wide, horizontal gap on the front of the home provides ventilation, while a bark overlay adds unique style to the piece. Attach the included, plastic adapter to the back of this home, to pole mount it with ease. Read through the included Beginner's Guide to Bats book for thorough information on these animals. The all wood body forms a hardy roosting spot, and an overhanging roof keeps the interior dry. 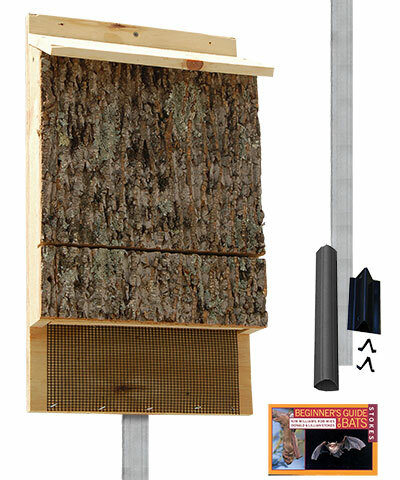 Welcome a beneficial bat colony into your yard with this Single Chamber Bark Clad Bat House and Pole Kit. House and pole made in the USA.